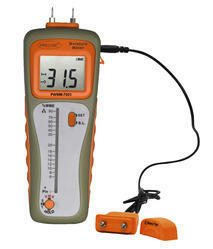 Bestowed by a team of highly experienced & qualified professionals, we are offering Wood Moisture Meter. we are engaged in providing the broad assortment of material testing instruments like Coating, corrosion, NDT instruments. Electromagnetic sensing technology is able to penetrate the wood inside, produce a three-dimension magnetic field with high precision. ▲ Portable Moisture Meter --- Used to measure the water content of wooden, fibrous objects, measuring range is 0 to 99.9%. ▲ Pin Type Wood Moisture Meter --- Insert the pins into the measured object approx.5mm. Easy operation, you can freely hold current data. From our unit in Ghaziabad, (Delhi NCR), India we are one of the premier manufacturers, exporters and suppliers of the Wood Moisture Meter. These meters are used to determine the moisture content in wood and concrete. These meters are vital in the installing of wood flooring and its maintenance and in the making of wooden furniture. The machine is compact light-weight and portable. 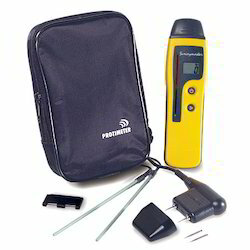 Protimeter Timbermaster is Worlds Best Brand which has now been taken over by GE . All exporters of wooden articles are recommended to buy this moisture meter as it is accepted worldwide by all .